Root canal treatment has received a bad reputation among patients as an unenjoyable and uncomfortable procedure. The treatment, also commonly known as endodontic therapy, is an essential procedure performed by the dentist to save an infected tooth. If not treated, there is a possibility that the tooth will not heal and you may lose the tooth, or much worse. If the infection is not attended to, it can cause you to become ill and in severe and rare cases, become fatal. Seeking professional dental help is imperative, so if you are in need of dental care contact our office today! Under the enamel, there is a layer called the dentin protecting the softer layer of pulp. The pulp is comprised of different blood vessels and is a shelter to the nerve of the tooth. There are numerous dental issues like chipped or broken teeth or tooth decay that can cause inflammation and infection of the pulp. This inflammation can cause sore and you’ll have to take root canal treatment. The treatment is very common and can be completed in one or two sittings. 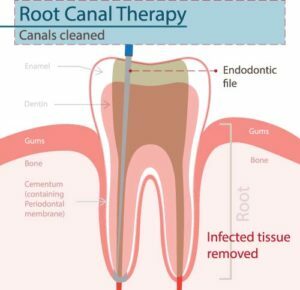 Root Canal Diagram, a root canal treatment which helps to remove infected pulp and the internal part of the tooth is cleaned and disinfected. Once the internal tooth is cleaned, it is then filled and closed with a rubber-like material. Then, a crown caps the tooth for protection. After the treatment, the tooth starts functioning normally and can last for long. Visit AAE.org and obtain a step-by-step video explanation of the procedure in detail. The staff at Trinity Premier Dental is ready to manage every tough situation and make sure that every patient is well taken care of. We offer a completely stress-free experience and do our absolute best to help remove any dental issues our patients are dealing with. We offer sedation dentistry in Trinity, FL to help eliminate any fears during root canal treatments and other dental therapies offered at Trinity Premier Dental. Contact us immediately if you’re looking for root canal treatment.